Pho, a Vietnamese soup featuring a rich beef broth, rice noodles, beef, and a few herbs and vegetables, is pretty much the perfect food. Pronounced “fuh,” this soup is flavorful and satisfying. It's light enough to enjoy on the hottest days of summer, but it's also ideal comfort food for the middle of winter. Here are our picks for the 10 best pho restaurants in Mississippi! At Aie's Taste of Thai, you'll find a variety of authentic dishes that will expand your culinary experience. Go ahead and try a few different things, because once you order their pho, that will be the only thing you'll want to order. The flavorful broth makes it our pick for the best of the best. Saigon Vietnamese Restaurant is known throughout the Jackson area for their incredible pho. Like all good pho, the broth is simmered for hours. The meat is added just prior to serving, and a plate of fresh sprouts, cilantro, and lime is served on the side for you to add yourself. At Little Saigon Sandwiches and Sushi, there's no shortage of options to choose from. You'll definitely want to try the pho, though. With nine different options, including steak, chicken, and shrimp, you can't go wrong. Want something more adventurous? Try the Pho Sach, made with tripe! Thai Lotus in Gulfport is the kind of place where you can order something different every time and never be disappointed. 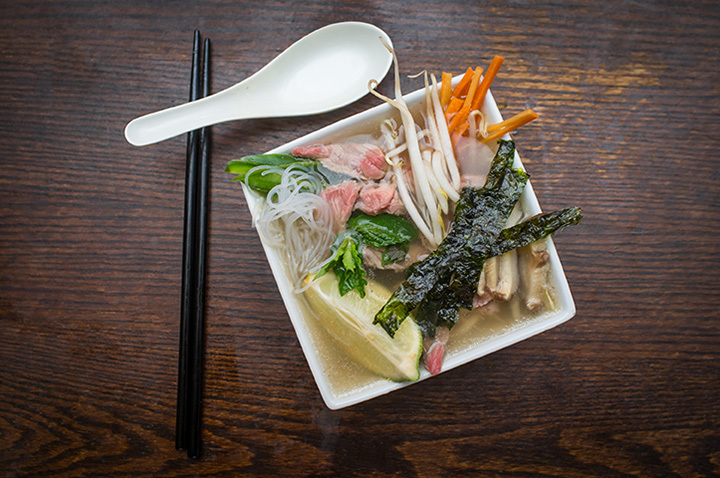 They have a number of pho dishes available, with options ranging from brisket to the vegetarian-friendly Pho Dau Hu. Don't miss this one! When a place names itself after noodles, you're expecting a solid bowl of pho. Luckily, at Blazing Noodlez in Corinth, the pho does not disappoint. Their pho is served with sliced beef, and when you taste the comforting soup served in the cozy atmosphere, you'll be racing here next time you get the sniffles. Columbus, Mississippi, might seem an unlikely home for some of the best pho in the state, but here it is as the Golden Bowl. Customers love the great service and excellent selection. Pair your pho with a Thai tea and fried tofu for a truly original experience. The Mississippi Gulf Coast is diverse place with people from a variety of backgrounds, so it's no surprise that you'll find as authentic a place as Kien Giang in D'Iberville. All of the pho choices here are top-notch, but the Pho Tai gets rave reviews. It's served with thinly-sliced, rare beef, which cooks in the piping hot broth. Ming's Kitchen in Oxford touts itself as a Chinese restaurant, but don't let that fool you. They have an excellent pho, made with flank steak, onions, mint, basil, and bean sprouts to go with the obligatory rice noodles. A perfect stop after a long weekend tailgating! You might have to stifle a giggle when you say the name, but What the Pho in Biloxi is serious about their soup. Looking for something a little different? Try the "Phoritto”—all of your favorite pho ingredients are tucked a tortilla and served with a side of broth! Planet Thailand is a cozy little spot in the river city of Natchez, and they're serving up big flavor. Enjoy a couple of sushi rolls alongside a big, comforting bowl of pho with your choice of beef, chicken, or tofu. You'll love the atmosphere here almost as much as the food!